We all know about WordPress! And most of us also know about WIX. If you don’t, Wix is an online CMS platform to create your website. The website builder allows you to select a template to start quickly and get a simple one page site or a complex e-commerce. 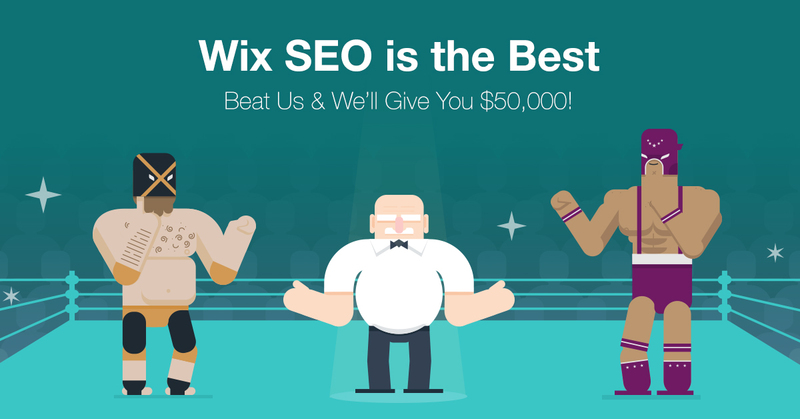 It has been relatively famous that getting great positions in SERP with a Wix site was difficult. Many seo professional complained on forums that it was always better to start from scratch on a new CMS than trying to work on Wix. Despite many attempts to change the way people think about their SEO, Wix has not yet been able to change the mainstream opinion. But this might be changing soon. The domain name of the Hero Website is to be registered by the Participant on or after November 16, 2016. The Domain name must be new and may not be obtained by way of resale or transfer of an already registered domain name. The Hero Websites must be created, maintained and promoted in compliance with the Google Guidelines for SEO (no black hat techniques should be used, otherwise you will be disqualified). The content of the website is constrained by the rules (it should be in English, should not contain ‘border-line’ content like adult explicit or religious, it should not denigrates Wix and should abide by the Facebook guidelines too). Google Analytics and Google Search Console accounts might be shared with the organization team for verification purposes. You cannot take part if you reside in a US-embargoed country. Basically, only white hat techniques can be used, your content should be in English, about one or several SEO heroes of yours, the domain name should be purchased for this occasion, and you should be able to share your google analytics and search console to the organizers to prove you have not been using black hat techniques. During the period between March 13, 2017 and March 15, 2017, each day at 12:00 PM ET (noon), and 08:00 PM ET, the moderator will search the term “SEO HERO” via Google Search. Overall, there will be 6 events of search. The moderator will take note of domain names that will rank first on Google’s organic Search (excluding local search results) out of all the Hero Websites participating in this Contest (who have not been disqualified). The Hero Website that will win the highest number of Search Events shall be determined to be the winning Hero Website of the Contest and the Participant who owns such website shall be considered to be the winner of the Contest. In case of draw, the moderator will conduct an additional 7th search on March 16, 2017, at 12:00 PM ET (noon). The website which shall rank first out of the Final Websites shall be determined to be the winning Hero Website. So, you need to rank first most of the time between March 13th and March 15th to win the contest. If you win, well, you’ll get a $50K price. Otherwise, if Wix wins, it will offer $25K to charity, and will split the remaining $25K to the 3 Alternate Winners (those who rank 1st, 2nd and 3rd after Wix website). So this contest is a really great opportunity to SEO professionals who want to compare their skills. If you plan on taking part in the challenge, drop us a comment below and will will try to help you.